There's a new challenge up at the Fusion Card Challenge Blog. Just what we need here in the Northern Hemisphere where winter has it's grip on us! Take a look a the lovely spring colors on the pillows of the inspiration photo! I went totally with the photo this time using the colors and flowers for my inspiration. I got out the PTI horizontal stripes coverplate for the background - stamping this wonderful sentiment from Birthday Cheer directly on the die cut. I layered it over a Hibiscus Burst card base. I die cut the flowers out of cardstock and patterened paper using Spring Flowers dies from Lil Inker Designs - layering them with foam dots and adding rhinestones to the centers for a little shine! So please join in with us and link your card over at the Fusion Card Challenge. What inspires you this week - the photo or the sketch - or will you do a FUSION and join the two?!?? Here also are links to the talented Design Team blogs! 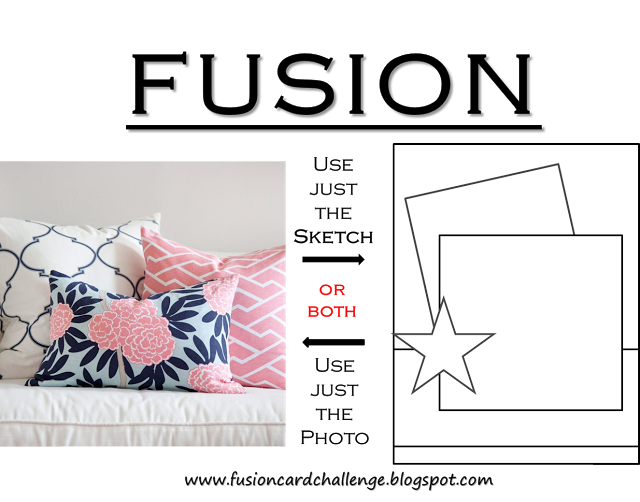 Accessories: Dies - Cover Plate Stripes/Horizontal - PTI, Spring Flowers - Lil'Inker Designs, rhinestones Kaiser, foam dots. The elegance of this card is simply astonishing! Love it!!! Such a pretty card Julia! Love the beautiful blossoms! Julia great bold stripes and all those pretty dimensional flowers! So beautiful! Beautiful card. Love the cover plate die cut over the pretty pink and the layered flowers are gorgeous. 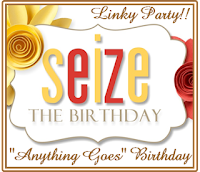 Thanks for sharing with us over at Seize the Birthday. Love that coverplate you've used...perfect for the inspiration, Julia! Those are some fabulous blooms too...beautiful card! A striking elegant design, lovely card. Oh, it's just gorgeous! Love the bold stripes and pretty blooms! 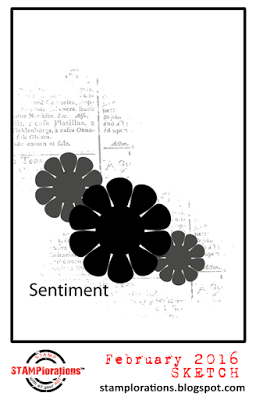 LOVE your card - the background is crisp and structured so the florals on the front really flow nicely. It's beautiful you used patterned paper on the leaves (IF you made them, perhaps they came this way). I hope winter loosens its grip on you - I live in Canada (British Columbia) and we have had very mild temps, practically NO snow - and my sister who lives at the coast has full on bulbs blooming! I have been listening to BBC a lot on my iPhone and so I do hear your weather broadcasts, wow. Sending you a WARM Canadian hug. Julia so beautiful I love your flowers! WOW! what a HIGH impact card!!! LOVE the large blooms! So pretty in pink...love your sweet card. This is a Gorgeous card Julia! The pattern paper for the flowers worked Perfectly!!! So glad you joined us at Seize the Birthday! 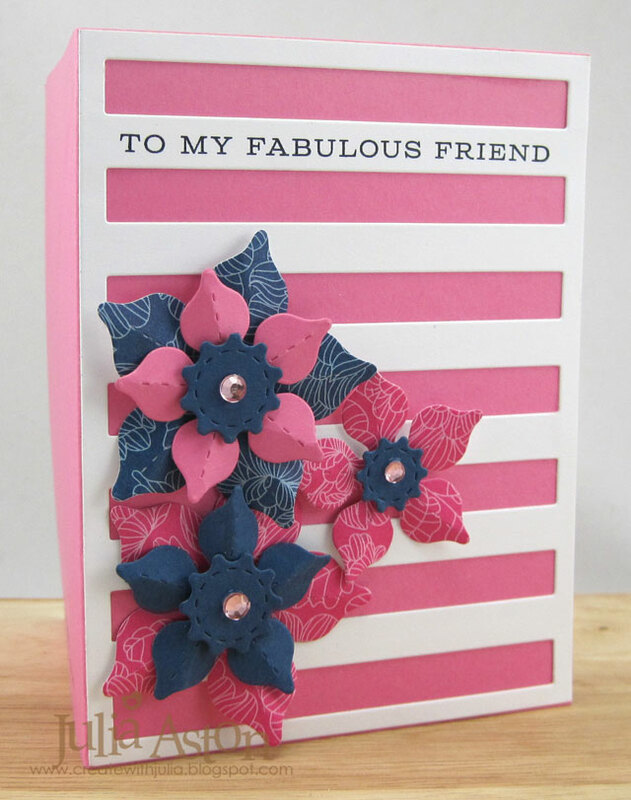 love your patterned paper blooms! This is very expressive and pretty! Oh Julia, this is so frilly and fun and just perfect for Fusion! All the good Fs! Thanks for sharing it with us at STAMPlorations too! Your striped background creates a fabulous dramatic backdrop for those gorgeous flowers! Love this card!